So I purposefully went to a thrift store to pick up a Monopoly game because I thought it would be cool to make some jewelry out of some favorite past times. But how do I translate the game pieces into wearable art without making a shoe and an iron into a Charm Bracelet? 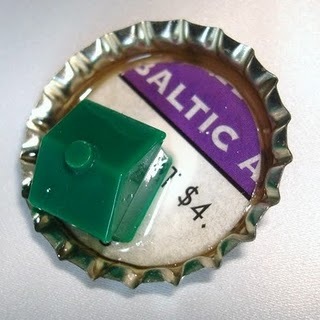 Let’s dump it all into a bottle cap! It’s this cool. Now you owe me $6 for landing here. Oh, oh, and I found some Mahjong tiles in my beading supplies. I'm matching it up with some Green Seed Beads and Voila! 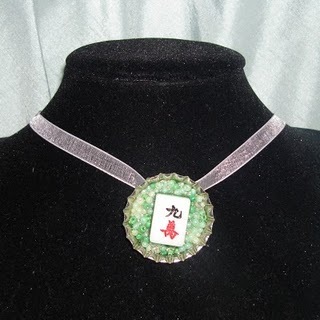 Just like the rest of my Bottle Cap Pendants, glue on a Bail and a nice matching Ribbon. Would love to be a crafter, and how I wish I were a techie! But, alas, I just cook. And cook some more. Cooking is a craft! Best part is you get to EAT what you make!